What great timing. These sixteen ounce Stemless Wine Glasses are perfect for the Holiday season. Decorated with the jovial message of “Cheers” and “Joy”, they would be perfect as a hostess gift. The Stemless glasses provide the perfect handhold to look, swirl, smell and taste fine wine of all kinds. Further, its versatile shape just begs for more uses: you can fill it with ice for highballs and mixed drinks or showcase cold soups, appetizers and desserts. It would also makes a great tea-light holder or impromptu vase. 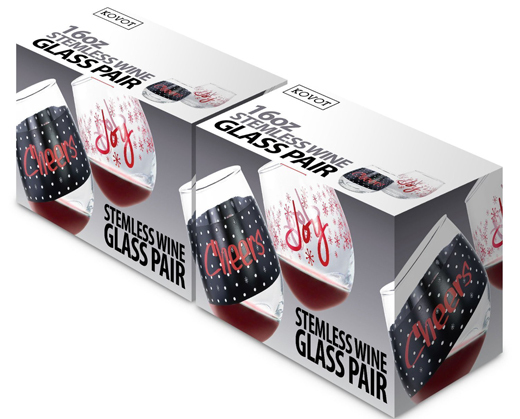 What better way to bring cheers and joy to your holiday this year, than to have the KOVOT Holiday CHEERS and JOY Stemless Wine Glass Set? 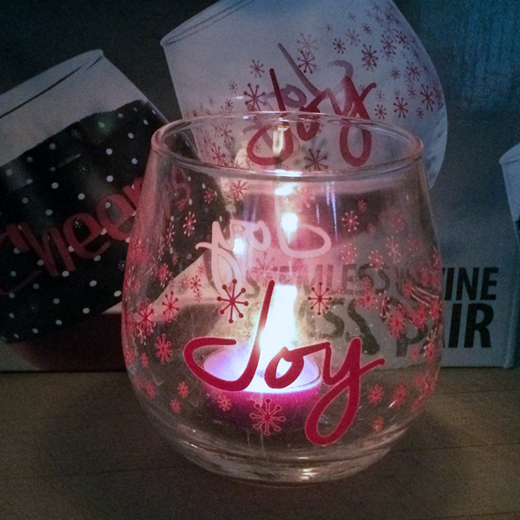 This set of 2 wine glasses feature the holiday sentiments of "Cheers" and "Joy". Each stemless wine glass holds up to 16 ounces. The trendy shape is great for drinks or party desserts, and the set makes for a great hostess or holiday gift. Hand wash recommended. This Set Of 2 Wine Glasses Feature The Holiday Sentiments Of "Cheers" and "Joy"